Exploring black health & the value of African-American dietary heritage. 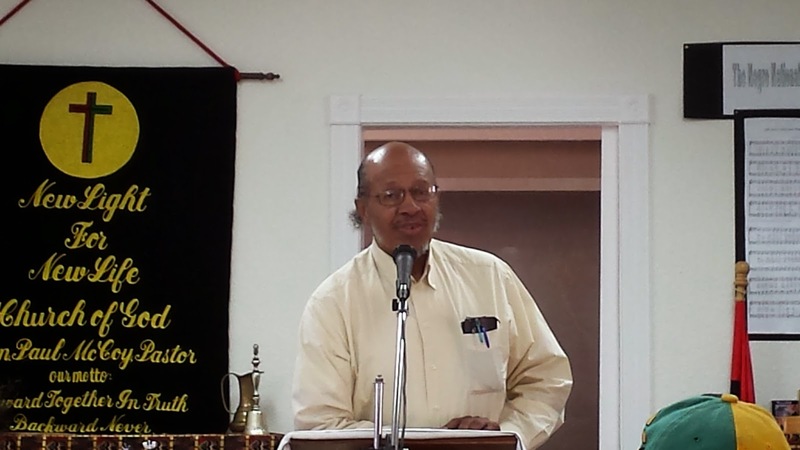 In late March I attended the Black Farmers Community Meeting & Video Showing Dr. Claude AndersonOn BLACK Powernomics. The meeting was held at a local church, New Light For New Life Church Of God & was headed by Rev. Dr. Floyd D. Harris, Jr. Guest speakers included Will Scott, President of African-American Farmers of California, Ken Grimes an agronomist from the USDA, & Rev. Dr. Floyd D. Harris, Jr. The meeting started with a viewing of video featuring Dr. Claude Anderson & his work on Powernomics, a book he wrote on empowering African-Americans economically, through ownership & through developing industries. After the viewing we had the privilege of hearing from Will Scott, who's past TEDxFruitvale talk was phenomenal. He spoke about the dwindling numbers of Black Farmers in California, & how we are down to less than 500! He spoke of the need for more African-Americans in farming which is a billion dollar industry. Will Scott was followed by Ken Grimes of the USDA. He spoke of his youth on a coffee farm & his experience in agriculture. He spoke of the opportunities available through the USDA to get involved in farming, & also of the programs that are available to teach farming skills. Rev. Dr. Floyd D. Harris, Jr. spoke about the billions of dollars in agriculture & how African-Americans are partaking of such a tiny portion of it. He spoke of the grants & opportunities to get into farming & his desire to encourage youth to enter this lucrative industry. He then told of the 22 acres the church would be breaking ground on soon in collaboration with the African-American Farmers of California, to teach youth agriculture. The meeting was followed by a lively discussion about the opportunities in farming, the 22 acres to be planted, & the opportunities to sell the produce to the community. My personal motivation in attending was to see if I could learn of any African-American farmers that might have a Community Supported Agriculture program from which I could purchase produce. Upon finding out just how few black farmers are left, it was no surprise to me why I had so much trouble in my search. The meeting concluded with free seeds being given out to all who attended & a tractor demonstration. 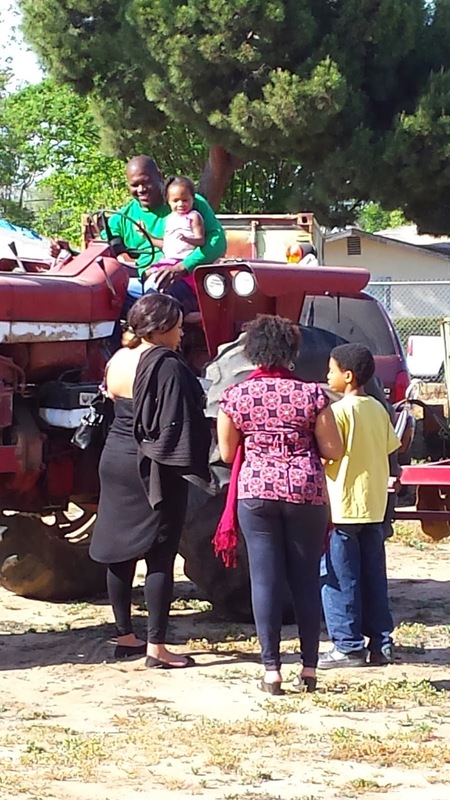 As of last Saturday, the Black Farmers community meeting group, with the leadership of Rev. Dr. Floyd D. Harris, Jr. broke ground on the 22 acres & began planting seedlings. The youth were taught how to plant the seedlings & rode on tractors. I thoroughly enjoyed the Black Farmers community meeting & am so excited & proud of what the group is accomplishing. I enjoyed this opportunity to learn about farming in my area & in California & look forward to connecting again with this group in the future. Last Wednesday, I was browsing through my News Feed on Facebook, when a post from a local organization caught my eye. The Downtown Fresno Partnership, who states their mission as ‘to promote the development and revitalization of Downtown Fresno’, announced that they had two tickets to give away for an event called the Fresno Food Expo. The pair of tickets would go to one follower on their page; all I had to do was leave a comment telling why I wanted to go. I hesitated, and was about to browse away, but I decided to just go for it anyway. When the announcement time came, I was scrolling down the page, when I saw it: there was my name in a post of it’s own. I had won! The Fresno Food Expo is ‘a unique, regional food event showcasing food producers from the San Joaquin Valley region to local, national, and international buyers’. The Central San Joaquin Valley of California is one of seven of the most fertile valleys in the world according to the Fresno Historical Society. Often referred to as the 'Bread Basket of the World', the Central Valley is a cornucopia, producing much of the world’s fruits and vegetables, as well as other agricultural products. 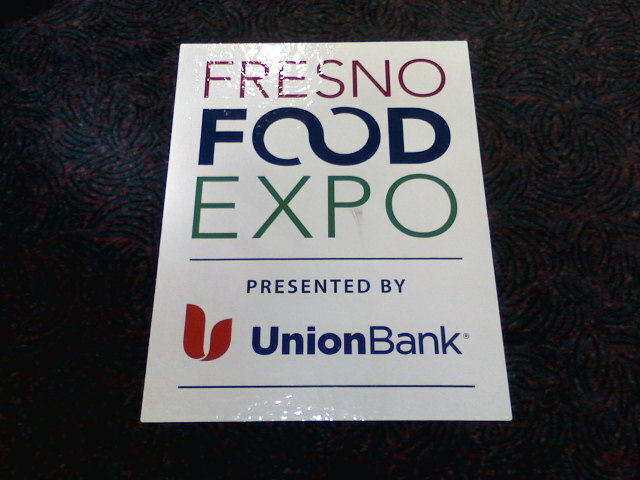 The Fresno Food Expo is in its third year now, and I have been following its news from the start, but this year I would finally be able to attend and my mother could experience it too! The next day was the day of the event. Heading into Downtown Fresno early, my mother and I picked up our tickets from the Downtown Fresno Partnership office, and headed over to the Fresno Convention Center where it was being held. When we arrived at the doors of the convention center, our tickets were scanned and we were allowed inside. As we walked toward the exhibit hall, a staff member offered us wristbands for alcohol. I don’t drink so I smiled and declined politely, but my mom, not realizing what the bands were for, eagerly took hers and received a commemorative snifter. I watched in surprised amusement until it was pointed out to me…I was missing out on a free souvenir! I got the wristband anyway and received a snifter of my own. Neither of us used them all night, but we love them anyway. Five o’clock came and we let the line move forward a bit before getting in it and heading toward the open door. As we approached the entrance we came upon a row of display tables where we received tote bags, a program guide, and copies of ‘Central Valley Flavors’, a yearly publication by Central Valley Magazine, a lifestyle magazine produced by our local newspaper, the Fresno Bee. 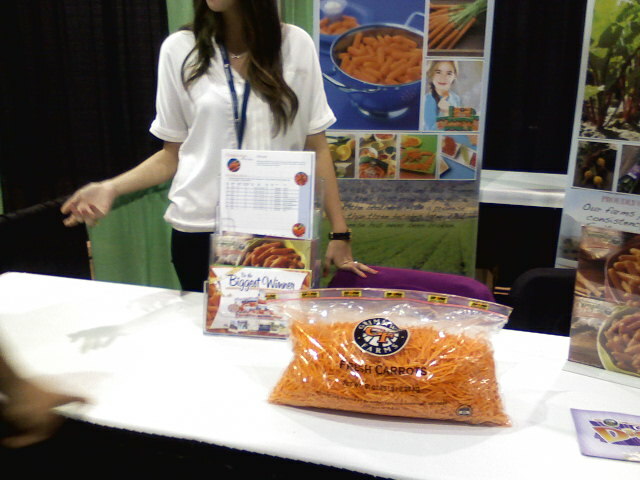 We arrived inside and the first booth we were greeted with was Homegrown Organic Farms. I was excited because I had visited their website before. I found them while searching the Internet to learn what organic farmers are in the area. 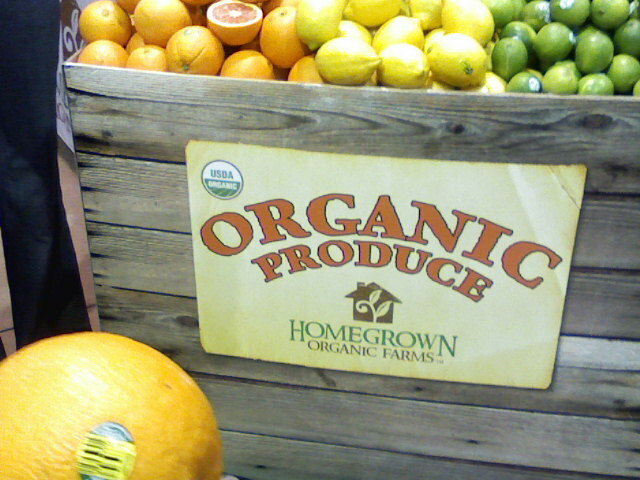 The booth was a striking, colorful arrangement of fresh, organic citrus. The man and woman operating the booth were very friendly, and gave us an orange and tangerine to sample. We moved forward a few steps in the crowded hall and saw a giant raisin. It was the California Dancing Raisin, the mascot for California Raisin Growers in the Central Valley. It took a bit of nudging but the woman running the booth and my mother convinced me to have a photo taken with the raisin. The booth staff handed out samples of a Kasha and Inca Red Quinoa salad with California raisins. The salad was pretty good, which is amazing since we both haven’t really cared for quinoa in the past; this salad was an exception. 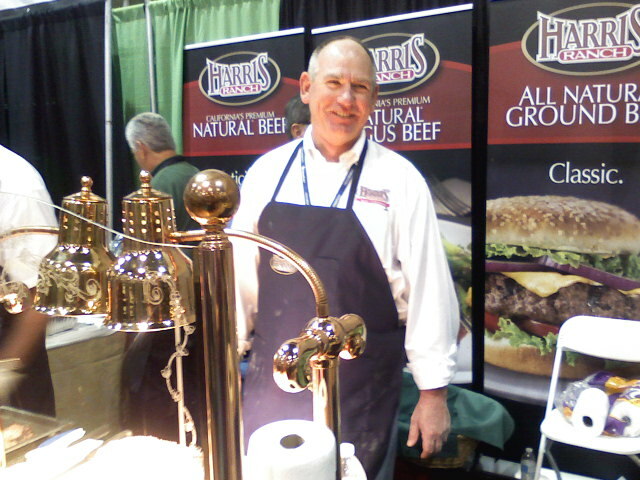 Then there were the sandwiches at Harris Ranch Beef. The aroma wafted toward us before we could even reach the booth. They smelled wonderful. 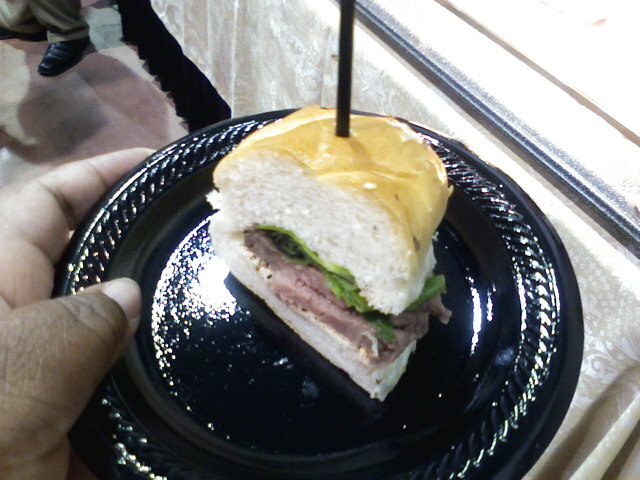 There were roast beef sandwich samples, sliced and prepared fresh at the booth. Though not organic, the cattle used to produce Harris Ranch Beef spend the majority of their life on pasture. The sandwich was amazing. The roast beef was moist, tender, and flavorful! Simonian Farms is a local farm store that doubles as a museum for vintage farm equipment and nostalgic memorabilia. They have delicious goods, and old-fashioned snacks, and even had a visit from President Bill Clinton back in 1995. Their table had an array of some of my favorite treats from their store: chocolate covered raisins, yogurt pretzels, regular and golden raisins. 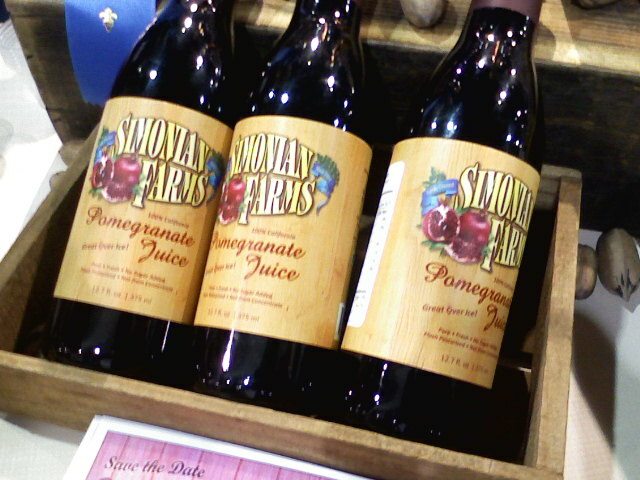 This time around they had samples of locally produced pomegranate juice, which was tasty and refreshing. We stopped in the New Product Peoples Choice award voting area for a short break, and to take in all that we had already experienced. On the table were four cans of flavored sparkling spring water. 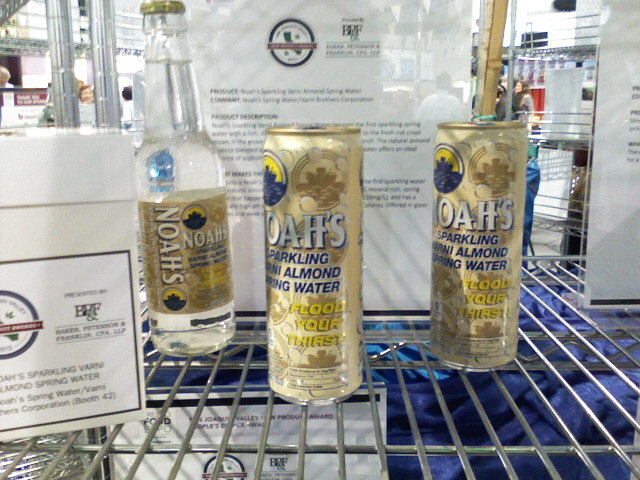 The company that produced these was called Noah’s Water. My mother had read about their high pH water in a book called The Seven Pillars of Health by Dr. Donald Colbert in her research on water alkalinity in her holistic fight against breast cancer. Their booth was definitely one we needed to visit once we were done with our break. We came upon Cal-Organic, which is owned by Grimmway Farms. I’ve seen their brand many times in stores and have picked their brand up on occasion. My mom juices carrots on a somewhat frequent basis in her health battle and buys large 15 lb bags of their carrots at a time. We began chatting with the staff at the table to learn more about the company. We noticed a large bag of organic shredded carrots on the table and inquired about the price. They were complementary; what a wonderful surprise! 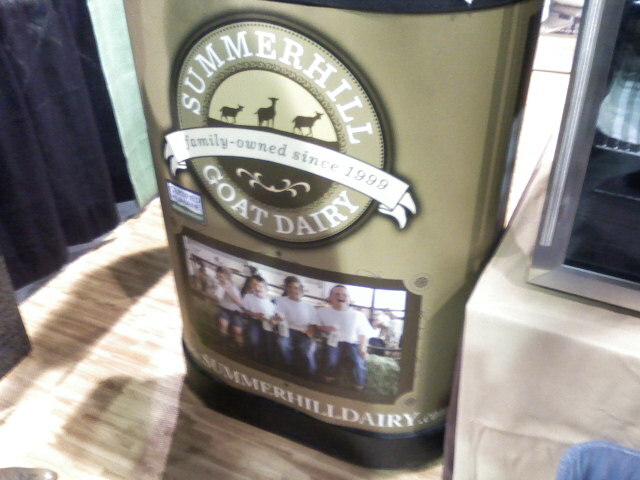 I never had goat milk before the Expo, so my sample with Summerhill Goat Dairy would be my first time. I’ve heard a lot of buzz about goat milk so I was eager to see what it was all about. Summerhill Goat Dairy’s goats thrive on non-GMO feed with no artificial hormones or antibiotics. The milk is low-temp pasteurized and minimally processed. I was amazed by the taste. It was wonderful and smooth, and so fresh, I had to remind myself that it wasn't in fact raw. What an amazing product. I may just incorporate some goat milk into my diet, alongside my whole, pastured, organic, raw cows milk from Organic Pastures! We walked on and discovered an intriguing booth. Flick’s Candy Co produces chocolate candy that comes in three varieties and is non-GMO. We tried two each of the milk chocolate, the dark cacao, and the dark cacao with sprinkles. 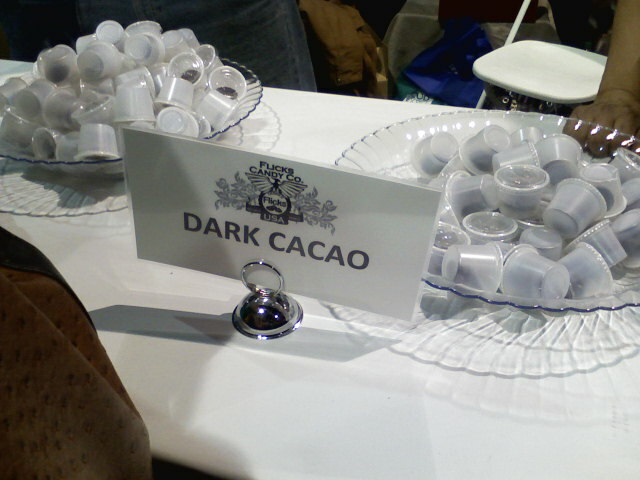 The dark cacao was our favorite. We purchased a few tubes to take home with us. We finally arrived at Noah’s Water. We first tried the spring water with its alkaline pH and natural magnesium, essential for many functions in the body. It was very good and I’m glad we go to try it for the first time. We then were introduced to their new flavored, sparkling varieties, which included Blueberry Pomegranate, Peach Mango, Lime, and Varni Almond! The flavored waters were very nice, despite having no added sugar and no replacement sweetener. I opted to try the Blueberry Pomegranate first which had a fruity note, then tried the Varni Almond, which had the real flavor of almonds! We were moving on to the next booth when a wave of coolness and feeling of refreshment washed over me that stopped me in my tracks. Never had I felt that way after a drink of water. I relayed this to my mother who also noted she felt noticeably cooler and more energetic. We doubled back and asked if we could purchase more. There was none available to purchase at the Expo itself, but their products are available at Food 4 Less locally, and are also available for purchase from their website. 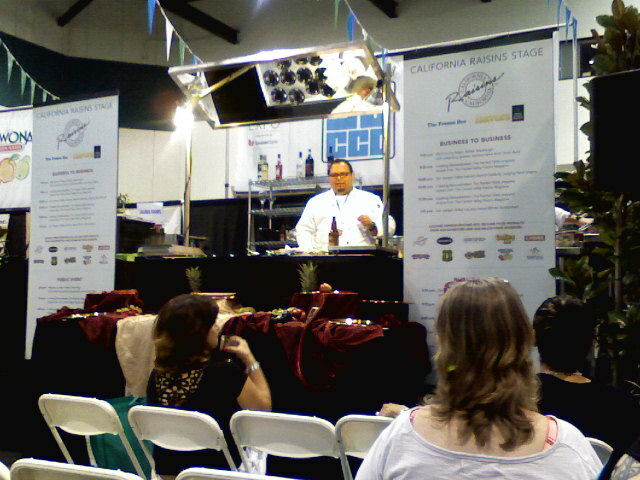 We went on to see that a cooking demonstration was taking place. We watched as local catering service, The Painted Table, prepared beer battered fish. The demo was entertaining and fun. At the end of the demo, samples were handed out, and the fish was amazing. The fish, a variety of cod, was moist, succulent, and flavorful with a perfect flaky texture, the fries served with it were perfectly tender on the inside, lightly crisp on the outside, and were well-seasoned. Last, but not least, we visited the table of Bravo Farms Cheese. I had been anticipating trying their cheeses for quite some time as they had initially produced raw milk cheeses. I have actually had a taste of some of their cheese through the wonderful sandwiches from Dusty Buns Bistro Bus, our local food truck icon with organic, seasonal, locally sourced offerings, and a burning passion for what they do despite the obstacles that they’ve had to overcome. 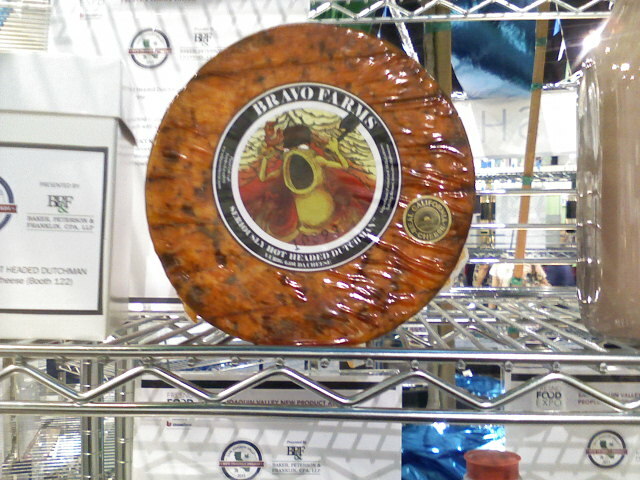 I had never tried Bravo cheeses fresh before so this was a great opportunity. We sampled several of their varieties. I favored their new offering, the ‘Seriously Hot Headed Dutchman’ and my mom favored their bleu. At around 7 o’clock the winner of the New Product Peoples Choice award was announced. The winner was Rosa Brothers Milk Company. The results were not surprising, as they seemed to be the buzz of the show along with another local dairy producer, Dairy Goddess. 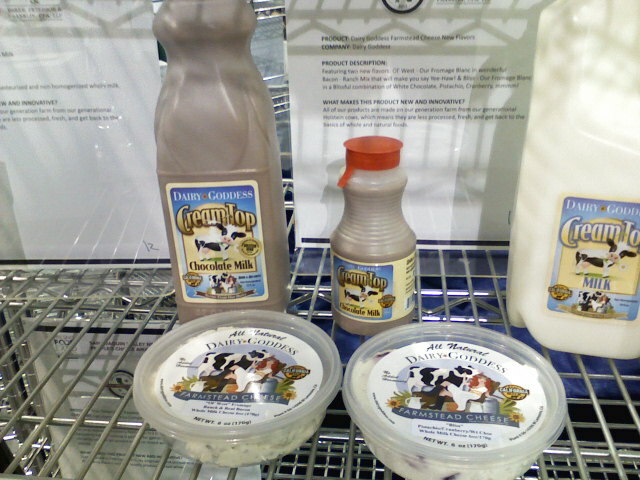 Both are local, family owned dairy producers, with unique varieties of flavored milk. 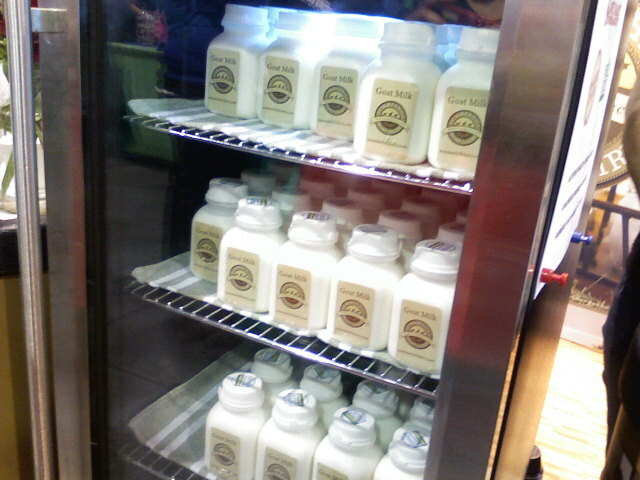 Dairy Goddess is known for their chocolate and strawberry flavored milks and their various flavors of farmstead cheese. They also have a line of minimally processed milk that retains its lovely cream top. 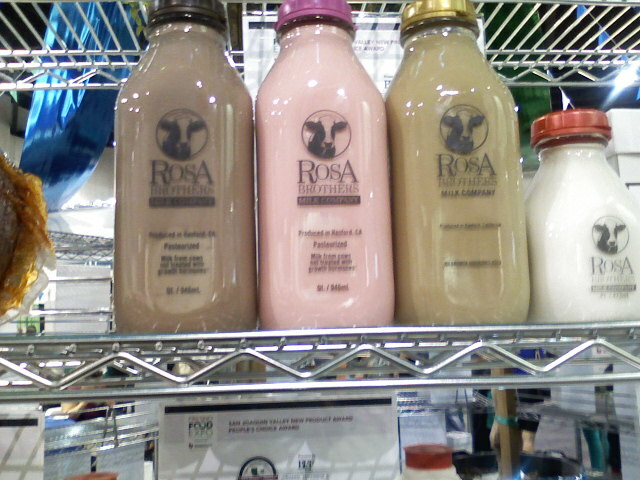 Rosa Brothers is also known for their flavored milks, but I think what took them over the top was a very unique root beer flavored milk. Neither brand is organic but I’m sure they are much better choices than much of the conventional, confinement produced, over-processed milk products available today. When we got back home, we wound down and reminisced on the wonderful experience of the evening. We split the orange and tangerine from Homegrown Organics and they were wonderful! They were up there with our own backyard oranges, which doesn’t happen often. We also enjoyed more of the Flick’s dark cacao candies. The Fresno Food Expo was an amazing show and beautiful showcase of what the Central Valley and Fresno, California have to offer. We literally only made it through half of the show, yet we experienced so much and had so much fun. There were several booths that I wish we had time to visit and I look forward to seeing more at the Expo next year! I have to admit that I have been struggling lately with my journey. I love the ideas and teachings of the Weston A. Price Foundation and of Dr. Weston A. Price but, while both my mom and I have experienced various health benefits from following those principles, weight-loss has not been one of them. As I mentioned in earlier posts, I've had some positive results in the past from following Atkins' but, I don't care for the overall dietary philosophy of Atkins' and believe it is too low carb. I've also made the mistake of not taking in enough fiber and watching my nutrient intake during Atkins' and it left me feeling somewhat weak and light-headed; definitely not something that I'm going to stick too as a lifestyle change. I've been learning a lot about Paleolithic dietary philosophies and am drawn to the lower carbs compared to WAPF and the continued focused on ancestral, omnivorous eating. While my personal feelings are that paleo tries to reach too far back, I like the premise of what it's about and am already experimenting with some of the principles. As I learn, both about real food and about what it's going to take to lose weight, I've decided that the central focus of my personal dietary philosophy is my ethnic dietary heritage. I feel that many cultures had an instinct for food combining with a focus on nutrient-dense foods and optimizing the use of the foods within their particular region. The traditional West African diet is a diet of native foods including, greens of many varieties, nutrient-dense sea foods, bone-broths, true yams, sorghum, okra, and black-eyed peas. The more I learn, the more I am committed to making these foods, and their history, a part of my life. In other news, I've tried true yams for the first time! It was an interesting experience. I had been researching true yams online, and found that they are a completely different plant than sweet potatoes, not even in the same plant family. 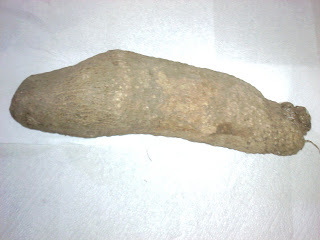 I learned the latin names for two varieties of African yam: Dioscorea Rotundata the "white yam" which is common in West Africa, and Dioscorea Cayenensis the "yellow yam" found in East Africa. I began asking around at my local farmers and co-ops with little luck. I ended up finding them at a grocer in Oakland whose shop came up several times in my online yam searches called Man Must Wak (formerly known as African Caribbean Food Market). My mom and I purchased three yams which totaled about 5 lbs, much larger than a regular potato or a sweet potato. We had been visiting my grandmother, and when I showed her a yam, she said it looked like a rat! Taking the yams back home we shared one with one of my local farmers that grew sweet potatoes and had never seen a real yam, which would probably be the common reaction with farmers in the U.S. in general. My mother and I tried cooking one like a sweet potato only to find that the yam was not very sweet at all and much more starchy in texture. It tasted like a regular potato and were not very happy with the results. We later cooked the second yam more like a potato and were much more pleased, though our cooking method left the yam a bit dry. I think we need more practice. Overall, I'm very glad to finally say that I've tried a yam and am looking forward to trying again. I will try to keep more up to date with what I am learning and also return to sorting all of the resources that I have been finding about African-American and West African traditional foods. I will also be bringing more of my weight-loss journey to the blog itself so that I can have more to up date with. I apologize for not having posted in so long. I have been experimenting with different dietary philosophies lately because, as part of my dietary journey, a major part of my goal is weightloss; thus, my Atkins' experimentation that I posted earlier. I want to see how different dietary philosophies affect my body, how well they fit with a traditional foods philosophy, and how likely I am to retain their different principles in my lifestyle. My overall goal with this blog is to share all of the wonderful information that I have learned about African-American and (West) African food traditions, health myths and benefits, and my journey in learning about and incorporating traditional practices. My weight loss and dietary experimenting has kind of side-tracked me from that. To stay on track, I will sharing my dietary explorations and other similar updates on the AAmnivore Facebook Page, so as to keep the general blog in focus, so keep an eye on the Facebook page if you would like to know what I'm most currently up to. Otherwise, I am still working on gathering all of the research that I've come across and deciding how to share it all so bear with me and I hope to share in depth with you soon. Come and 'Like' AAmnivore on Facebook! Over the past few days I've decided to go low-carb. I picked up 'Dr. 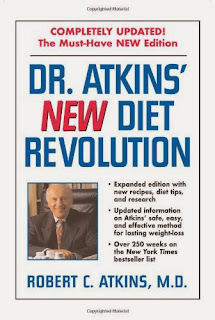 Atkins' New Diet Revolution' which I had never read all the way through and decided to actually read what it had to say. I got a large way through the first part of the book before I got a little impatient and flipped through to the 'Induction Phase' chapter. I understood a lot of what Dr. Atkins was trying to get across and decided that low-carb would be interesting to try again for a little while. I had done Atkins' once before and had lost 12 lbs. in 2 weeks, so I thought I would see how well I could do this time. I started 3 days ago, Sunday night with a dinner of organic sausage and eggs. That dinner seemed to really kick-start it because the next day I did started out a bit lighter and started the day out feeling good. On Monday I started the day with organic uncured bacon and eggs, and did pretty well eating high protein throughout the day. I had a few pitfalls as I snacked on natural chips and organic yogurt, and had a few glasses of Organic Pastures raw milk throughout the day, and I even had a small bowl of sprouted granola. Even with that my body successfully went into ketosis, burning fat for fuel, and I started Tuesday morning about 5 pounds lighter than I was Monday night. I kind of fell off the band wagon on Tuesday as I accidentally ate a banana, which my brain kept telling me was off limits, but I had not yet read that far into Atkins' so I caved. Later I had a slice of sprouted cinnamon raisin bread, and by late afternoon I had a large bowl of organic oats and honey granola with Organic Pastures raw almonds. I felt the change in my body fairly quickly and could tell that my body was pretty much out of ketosis. At this point I went to the Atkins' book and read more thoroughly what was and wasn't allowed. I wasn't supposed to have fruit, bread, nuts, grains, or dairy products other than cheese, cream, or butter. I had consciously made an exception to the rules for the raw milk, but not so for the other foods. I had remembered upon previously glancing through the Atkins' book that I was supposed to limit to 20 grams of carbs, which I did well the day before, despite eating from the don't list, but not so much for Tuesday. I started today at the same weight that I was Tuesday morning, thankfully, but not with further weightloss as I had idealistically hoped. I was a bit discouraged. We're a bit low on some of the tastier proteins that I enjoyed the days before, and I was bit more dependent on eggs and natural hot dogs than I'd prefer. I ended up starting the day with local, organic strawberries that were getting soft, that we didn't want to go bad. I then had scrambled eggs with with organic chicken sausage, bell peppers, green onions, tomatoes, and cheese. I had organic, grass-fed hot dogs with real relish and sauerkraut for lunch, snacked on yogurt with organic dark chocolate, and had chicken sausage and eggs for dinner. I'm feeling pretty good today, not as great as I did on Monday but, certainly better than I felt on Tuesday. I'm up late (yes, I know, sleep is important for health and weightloss!) but, here's hoping for some positive results Thursday morning. Visit the Shop for a funding goals.